The elongated silhouette on the MIDBAR #5 coat creates an airy and relaxed look while beautifully framing the body. 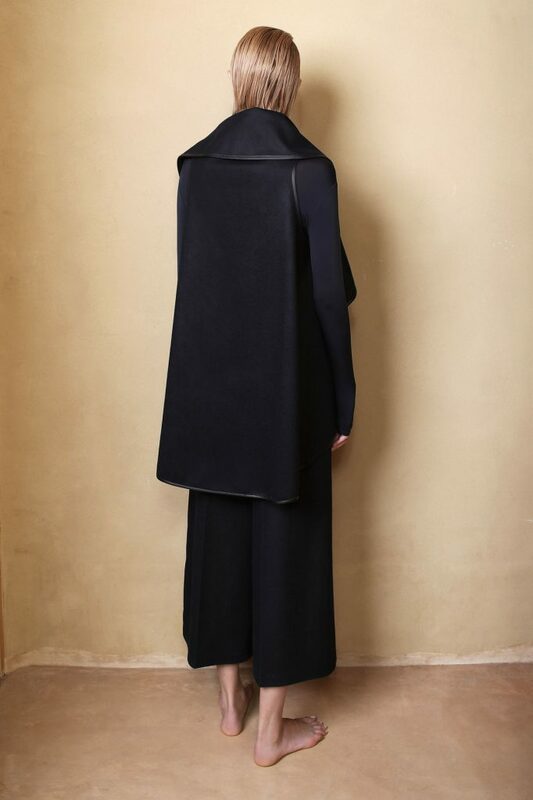 This longer version of the MIDBAR#4 coat, is a modernized update of the iconic Maskit EGG coat first designed in 1954. A versatile piece for your wardrobe that can be layered to work across the seasons for both casual and formal events. With an open-back design, hand-stitched embroidery and leather detailing, the iconic design continues to inspire new pieces within Maskit’s collections. The draping can be styled in a variety of ways, either in a classic fold and drape, resting on the shoulders and clasped with a pin in the center or worn as hooded cape. Soft to touch and durable fabric with a non stretch leather trimming.